Beautiful Designed Patio, Fire Pit, and Seat Wall Special Deal! Its summer and its time to grill out, roast some marshmallows with the kids, and have some drinks with friends and neighbors! If you are looking for a rockford landscaping company and patio designer that really knows how to pull off a stunning patio, look no further than Creative Concrete. Let our experts in stamped concrete and patio design get you on track for something that will truly impress your guests. Add a seat wall and a fire pit and it’ll make those parties unforgettable for your friends and family. Smores and drinks on the deck will make every summer perfect. For a limited time only for this summer, we are offering a $4500 deal for the whole thing. 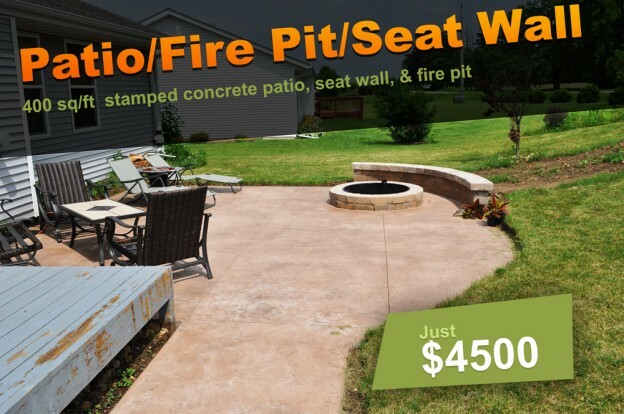 Get a 400 square foot stamped concrete patio, a fire pit, and a seat wall for one price. Give us a call at (815) 397-1223 and talk with John! Free tree with any landscaping patio! With spring here and summer close behind, its time to get that patio or walkway updated with a fresh brick paving style. Our experience will leave your guests and visitors awestruck with the amazing patterns and designs we can create for you. Call John today at 815-397-1223! We will throw in a free tree with any landscaping patio. Have the landscaping patio you have always dreamed of having. This entry was posted in Promotion on April 9, 2014 by admin. Spring is here, and it is about that time when fresh air replaces the frigid cold, leaves begin to grow from the bare branches, and grass will start to turn from yellow to green. Finally! And of course, you can finally get started on that retaining wall, deck for the cook-outs to come, or those trees you wanted to plant. 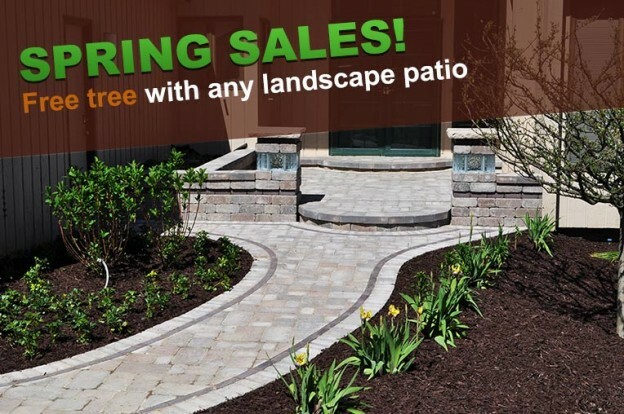 Rockford’s landscaping company Creative Concrete and Landscaping creative experts are here to help! Check out our gallery here. It took a long time for winter to get out of the way, but now that it is, we encourage you to give us a call to get started. Give us a call and mention this blog to receive $35 off your service, just mention that you came from the website or from our Facebook page. You can reach us at 815-397-1223, we look forward to hearing from you! This entry was posted in News, Promotion and tagged deck, landscaping, spring, winter on April 7, 2014 by admin.